The mountain ranges of Sahyadris has divided Maharashtra into four parts viz; Konkan Belt, Sahyadri Mountains, Ghats and Plateaus. The Ghats served as trade routes in ancient times. Goods received on the Konkan Ports were transported to the market places on the plateaus via these ghats. As a result, the nearby areas bloomed for trade, city dwelling, market places. The connectivity of the Sail ships resulted in emergence of cities like Kalyan, Mahad and Rajapur. In those days, some of the major trade routes were Varandha Ghat, Aambenali Ghat, Paar Ghat, Madhya Ghat, and Dhawale Ghat etc. These ghats served as the link to transport goods from the coastal ports to the market places/villages on the plateau region. Varandha Ghat (Mahad to Bhor) and Aambenali Ghat (Poladpur to Mahabaleshwar) are still in use as they have paved roads. To protect all these vital trade arteries forts like Bankot (on the mouth of Savitri river for coastal security), Kavla, Chandragad, Mangalgad, Pratapgad (to protect the trade routes), Kamalgad, Kenjalgad (to protect the plateaus) were built extensively. Chandragad to Arthurseat Point (Madhi Mahal) was also one of the old trade routes on the Dhawale Ghat. 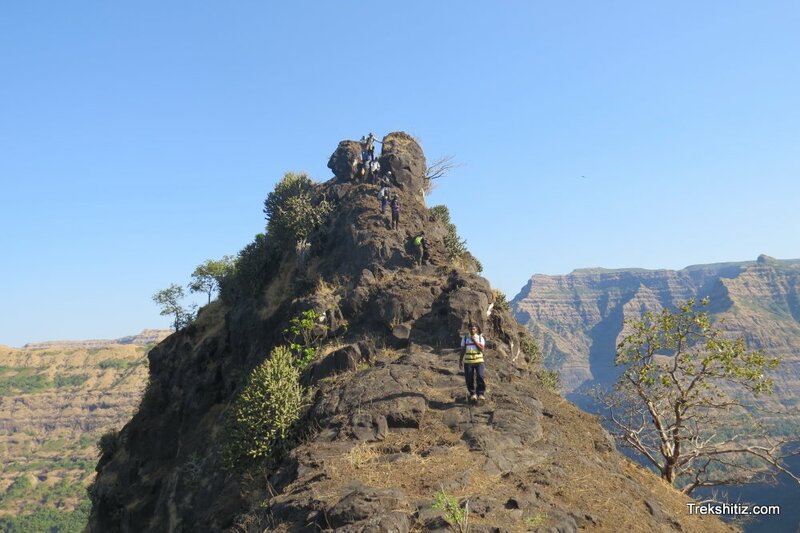 Chandragad to Arthurseat Point (Madhi Mahal) is one of the hardest treks in the Sahyadris. This trek demands ascending up to 4729 feet above sea level up to Aurthur Seat. It is a litmus test of stamina and patience. Chandragad fort is located on the eastern side of Dhawale village and is not easily visible from the village. There is a temple in the village. Keeping the temple to the left, the route to the fort takes us through farm fields before entering the jungle area. Further, one has to circumvent the hill in front of the fort which is a 20 mins walk approximately Initially keeping the valley to the left and then to the right, this route takes us to the base of Chandragad Fort. The ascend to the fort is of a medium steepness. The soil is loose and one has to ensure proper grip and balance while climbing. (There is a sign board at the start of ascend marking the route put up by villagers). Within 15-20 minutes of walk there is an open patch. This patch further leads to a rock patch. This rock patch has to be climbed to enter the fort. Further,10/15 minutes of walk leads to the plateau of the fort. The East is on the right. Here one can see a Shivling and a Nandi sculpture. After crossing one more rock patch we reach at the top of the fort. On the route heading towards north one can find a batan and grinding stone on the right. Further, on the same route there is a Water Cistern. This water is not potable. Ahead, down below, there are 2 more water cisterns which are dried and inaccessible. This route further leads us to a bastion. On the right there are 2 water cisterns and 3 on the left. The one on the right has potable water whereas the remaining cisterns are dry. Pratapgad and Mangalgad can be viewed from the fort top. This trail of the trek is the most tiring and test of one's patience and stamina to the peak. One has to descend Chandragad through the same route and pass the last rock patch. After descending the rock patch we come across a diversion. The path on the right takes us to Dhawale village while the left takes us to a valley. To reach here from the fort top it takes approx 15 minutes. The left path to be taken is very slippery and covered with grass. There is steep valley on the right hand side and fort wall on the left. One has to exercise extreme caution while moving on this path. After crossing this patch, we come to a marginal steep descend covered with trees. The soil over here is very loose due to which one has to take the support of trees to descend carefully. The chances of getting slipped and injured are high. The first 20 minutes trail is in the trees and the next 30 minutes in rocks after which we come across the course of a dry stream. From here, we have to take path towards right (South direction) which is the ascend for Bahirichi Ghumti. This route goes through a dense forest so trekkers have a relief from the scorching sun. The ascend has minimal steepness and one has to proceed keeping the valley to the left. The path from the right of Jorache Paani takes us to Gadhavache Maal which is to the South. This route is through a thick vegetation and with a nominal ascend. This path with many twists and turns takes us on a plateau in 15-20 minutes. From here we can see the mighty Mahabaleshwar Plateaus on the South and Arthurseat Point (Madhi Mahal). This is the last stage of the range trek. This path is of mixed vegetation which has thick cover of trees as well as open ground with tall shrubs and grass. Nearing the end of the path, there is a rock patch of about 15/20 ft. The rock patch is easy to climb as there proper holds to it. This rock patch is the final step to reach Aurthur Seat. Poladpur is 183 kms from Mumbai on Mumbai - Goa Highway. From Poladpur take a road towards Mahableshwar. On the same road, 8 kms from Poldapur there is a Kapade Junction. From the junction, Dhawale Village (base village of Chandragad) is around 18 kms. 1. It is highly recommended to take a guide from Dhawale village as the route is sparsely used and there are high chances of losing one�s way. Also it is advised to negotiate properly with the guide as at times the guide from Dhawale village may accompany us only till Jorache Paani. This is so because from Jorachi Panni the guide can return back to Dhawale village before getting dark. They may charge more money to accompany till Mahabaleshwar as they have to board a bus to get them back to Dhawale village. 2. The scorching Sun may take a toll in the open areas upto Ghumti. Hence, it is recommended to carry Glucose, Hydration packs/liquids, Fruits, Light eatables/refreshments etc to reduce the impact of the sun. 3. Since, we pass through a thick cover of vegetation full sleeve trousers and shirts are highly recommended. 4. The next source of drinking water from Dhawale village is Chandragad followed by Jorache Paani near Ghumti which is almost 7 hours walk. Hence, ensure to carry enough drinking water during the trek. 5. There are high chances of developing cramps in legs or muscle pain due to dehydration or continuous walking. Ensure to have proper medications along with a medical kit. 6. In this entire range trek there is one small and one large rock patch. Even though they are easy to access it is suggested to carry a 50/100 ft rope for additional safety reasons. 7. Its highly recommended to avoid Chandragad to Arthurseat Trek during the rainy season. Only Dhawale village to Chandragad trek is possible during the rainy season.